Virtual receptionists are professionals who are trained to handle the customer side of things so you can focus on more core areas of your business. The simple reason why they are so effective at managing your relationship with clients is that they have more expertise in customer service and free up time that you and your staff members don’t have. Virtual receptionists will utilise their superior training to help you maximise sales, minimise the cost of doing business, and keep your clients satisfied to help with a very high retention rate. They can handle large call volumes that can easily overwhelm an untrained person, including your full time in-house receptionist. As a result, some businesses resort to using inefficient voicemails. Least to say, it is not a good business practice to redirect your calls to voicemail, after all, your potential clients don’t have the patience. Here’ a closer look at what virtual receptionists in the UK can do for your business. A surge in calls can spell opportunity; this is because a large influx of clients is coming your way to offer you their business. The only problem is that it can be a tad bit difficult to answer each single call satisfactorily. Your receptionist can only do so much before getting overwhelmed. Every single missed call is a lost customer who will take their business elsewhere. When your receptionist takes a lunch break or has other urgent matters to tend to, those precious minutes could be causing you lost revenues. A virtual receptionist can help you minimise these issues and buy you enough time to answer all queries. When a client comes back for repeat business, it is a good sign that your product or service is doing what it’s supposed to. The only final touch you need is to provide the client with helpful guidance over the phone or email through prompt responses. If your receptionist calls in sick, or they are too overburdened, they will be too stressed out to offer a high quality of service. Since all your employees are focused on core tasks instead of being burdened with additional responsibilities, they will be able to perform at their peak potential. They won’t have to worry about being bogged down by issues such as answering client phone calls, addressing email, and managing their diary. A helpful virtual receptionist will be available to handle all these tasks with ease and efficiency. This productivity will go a long way in bringing more sales to your business. An in-house receptionist will cost your business more money. Costs such as salaries, pensions, precious office space and sick days will add up to a lot more than a small entrepreneur can handle. 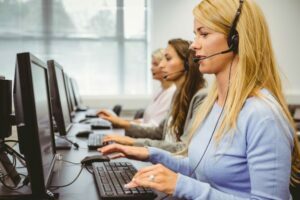 The simplest solution is to hire a virtual receptionist who will offer superior services to your clients and keep them engaged for the long haul. Are you interested in hiring professional telephone answering services to make your business more efficient? Click here to find out how.